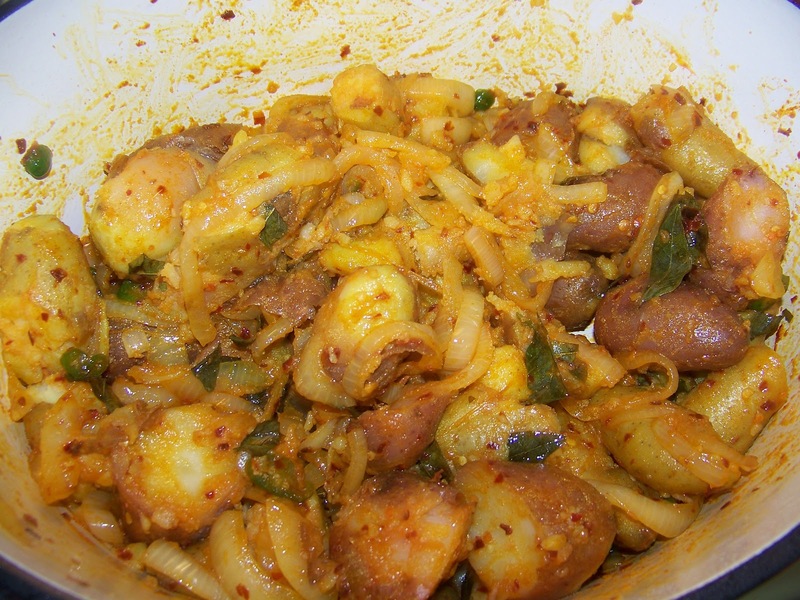 In Sri Lanka we have a dish called "ala thel dala" which translates into potatoes fried in oil. 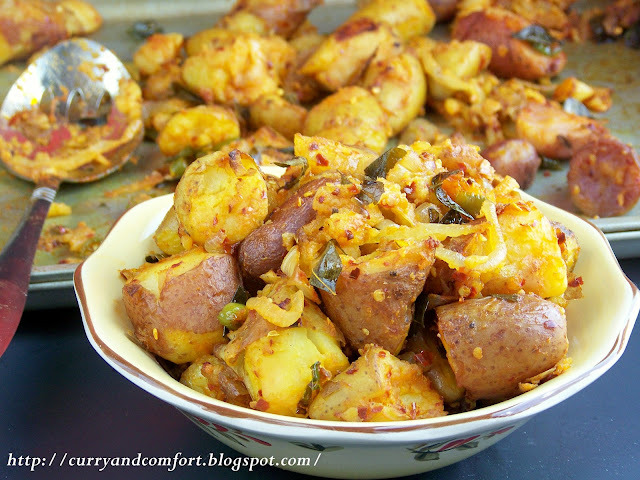 It's a spicy dish that I have already made here at Curry and Comforted called Spicy "Deviled" Potatoes. I decided to take this wonderful dish and roast the potatoes to see how it would turn out. It was fantastic because it gave the potatoes another dimension of flavor and texture. 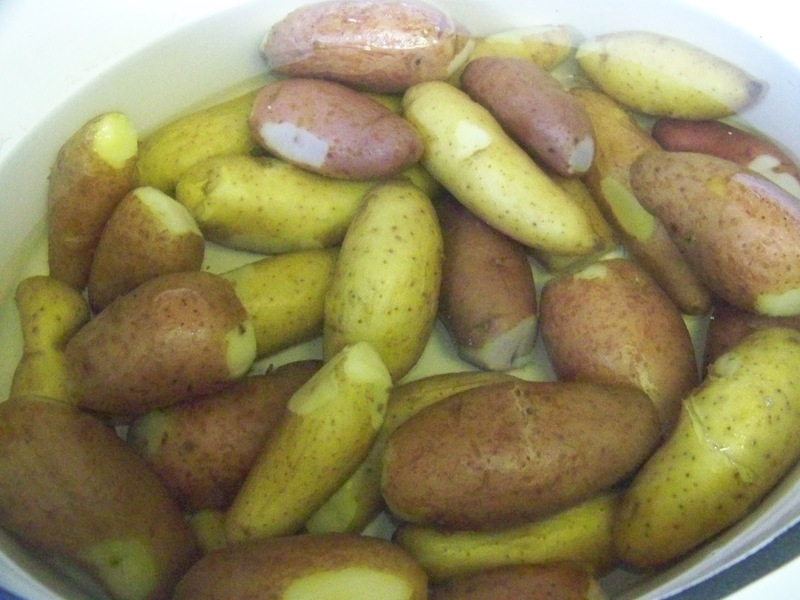 I also used a kind of potato called fingerling potatoes. These stubby finger shaped potatoes don't have to be peeled and I also wanted to see what the roasted potatoes skins would taste like in the dish. Now if you don't have access to fingerling potatoes, you can take regular baking potatoes and try this method. We ate this dish two ways in our house. 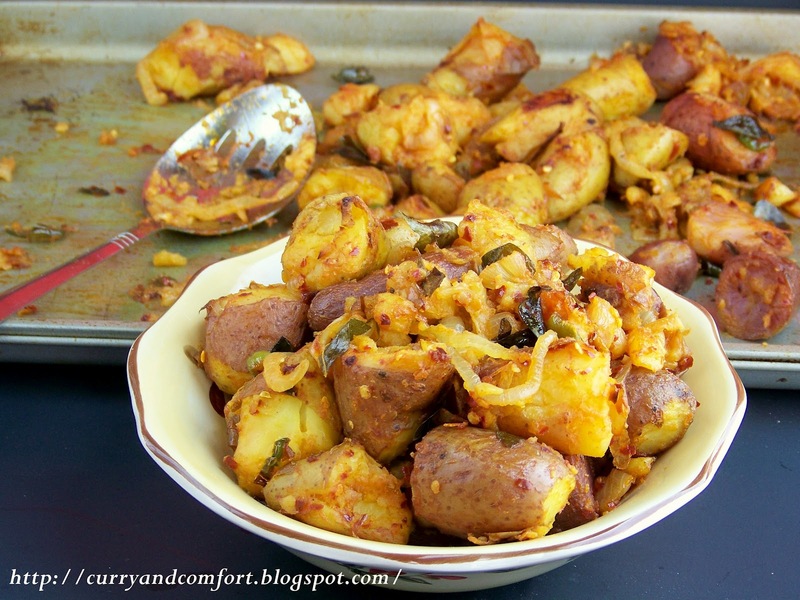 My kids and I smashed the potatoes with a fork (and plenty of spicy onions) then butter two slices of bread very well and put the spicy smashed mixture between the bread and enjoyed it for lunch. 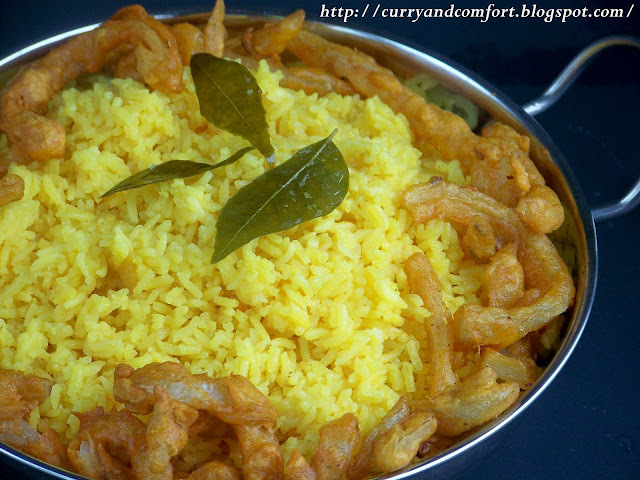 We also served the dish with a rice and curry meal. Perfect either way. 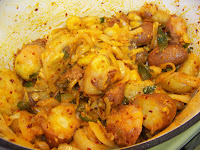 Wash potatoes well and boil until fork tender. 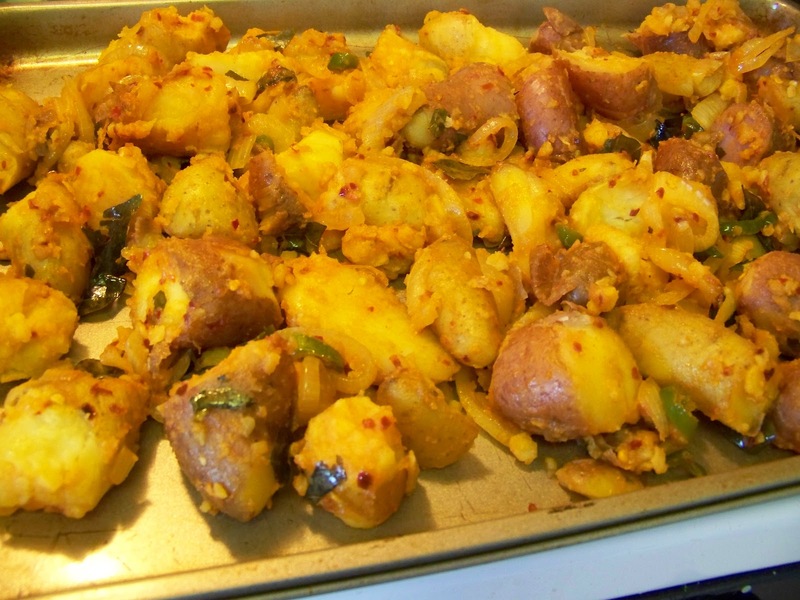 Drain potatoes and set aside to dry. 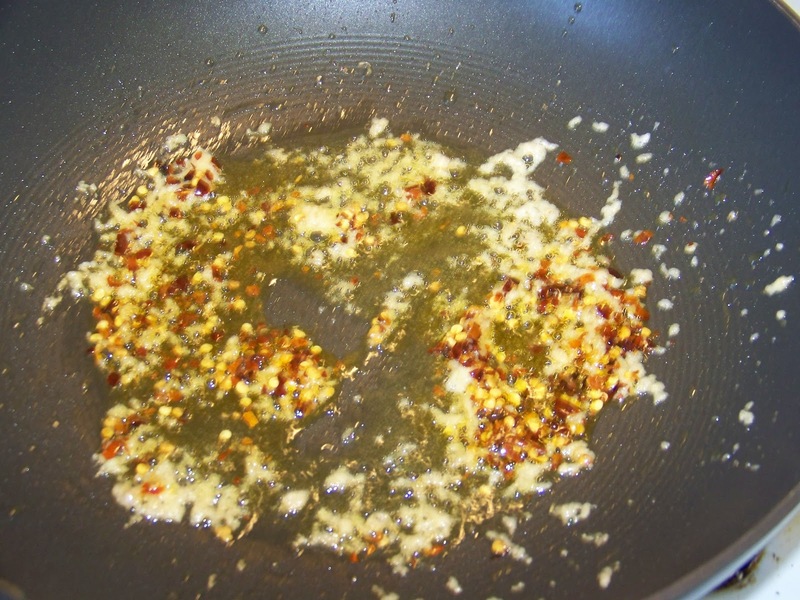 Then in large pan add 2 Tbs of canola oil. 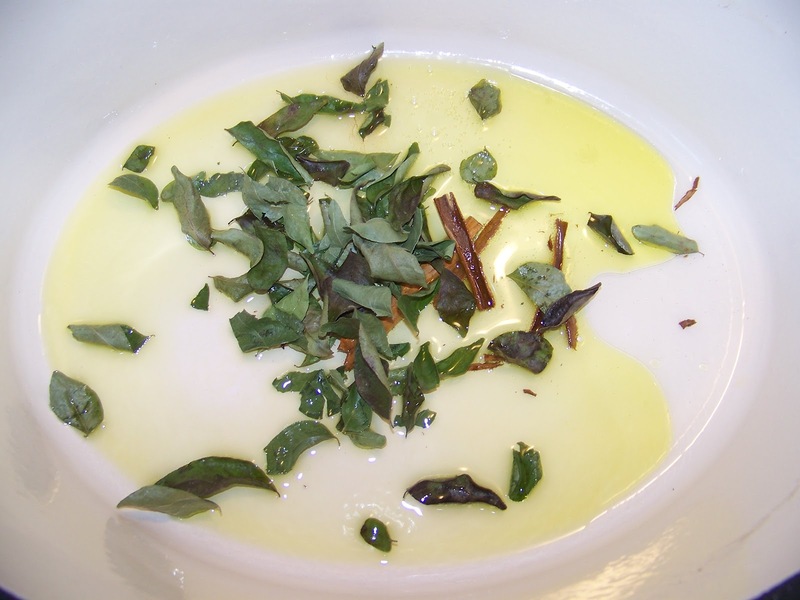 Once heated add cinnamon stick and curry leaves to sizzle in the oil for 30-45 seconds. 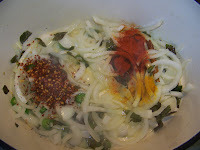 Then add the sliced onions and green chilies. 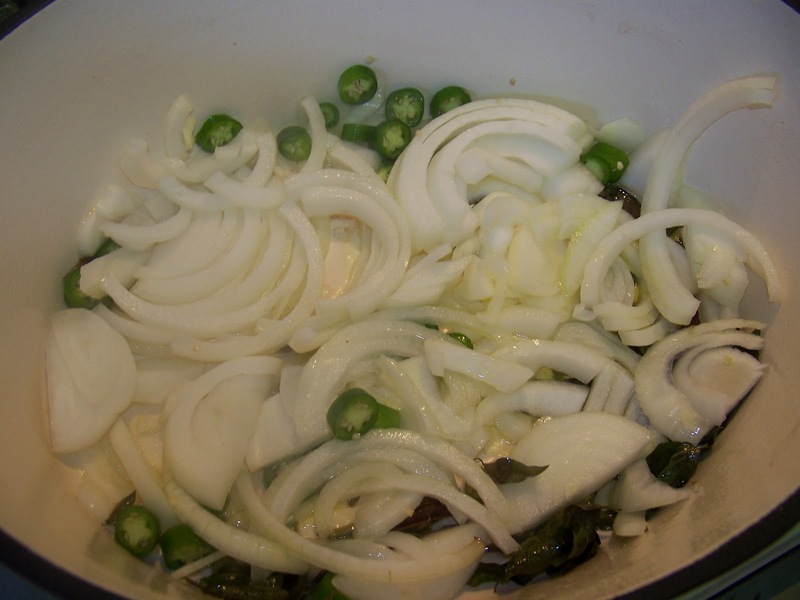 *Note the onions are my favorite part of this dish so I like to add a very large onion or at least 2-3 medium onions. Once the onions start to soften add salt, red chili powder, red chili flakes and turmeric. 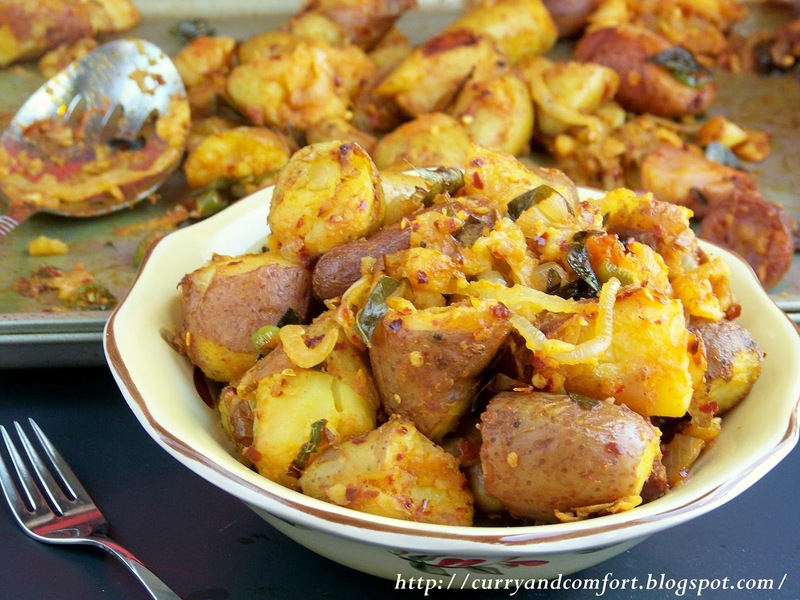 Cook the spices with the onions for 1 minute then add the boiled potatoes. Once the potatoes are mixed with the spices, taste for salt and seasoning. You can turn off the stove at this time. Now the dish is done and it is like the traditional deviled potatoes we serve in Sri Lanka. If you want to take the additional step of roasting them, add another Tbs of canola oil and toss the potatoes if you wish and place them on a baking sheet. Cut any large potatoes into half so they have more of a chance to get roasted. Roast in a 400 degree oven for 20 minutes. 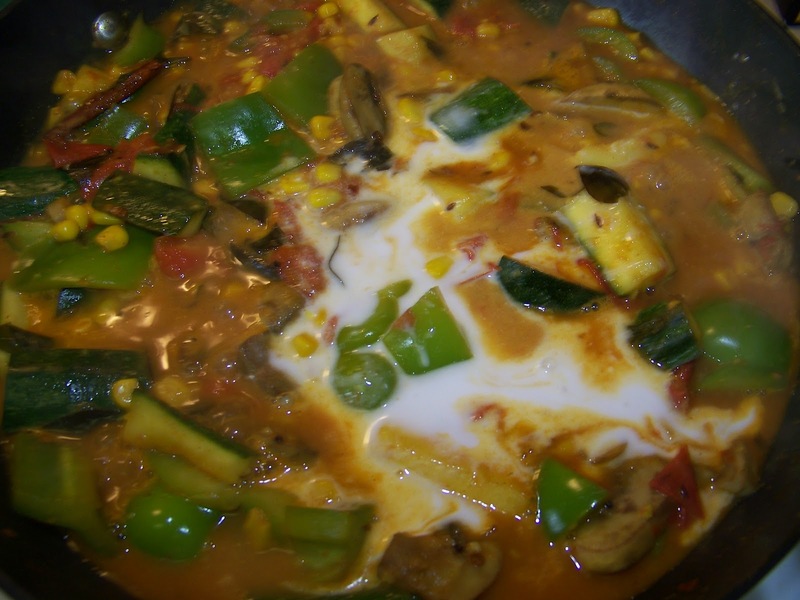 Serve hot with rice and curry or warm smashed inside buttered bread. Enjoy. 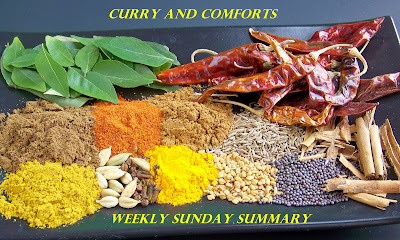 My Brother and Sister-in-law invited my family over for dinner this weekend for a wonderful rice and curry meal. I decided that I would bring a sweet treat for dessert and I simply took some ingredients that I had on hand and put this cake together. 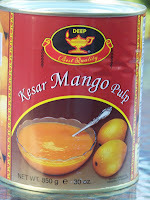 I had no idea if it would work or how it would taste, but I love to experiment. When it came out the oven it smelled wonderful and as the cook I had to do a quick taste test. I was overwhelmed with how tasty this cake was, but then I wondered if once the cake cooled down to room temperature if it would taste just as good. After dinner we served the cake and everyone loved it. So I knew I had to share this crazy, yet simple recipe for everyone to taste this wonderful combination of flavors. Use an electric blender to mix together the bananas, milk, oil and eggs. 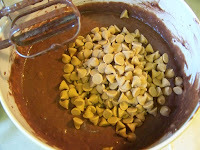 Then add the box of cake mix and mix until smooth. 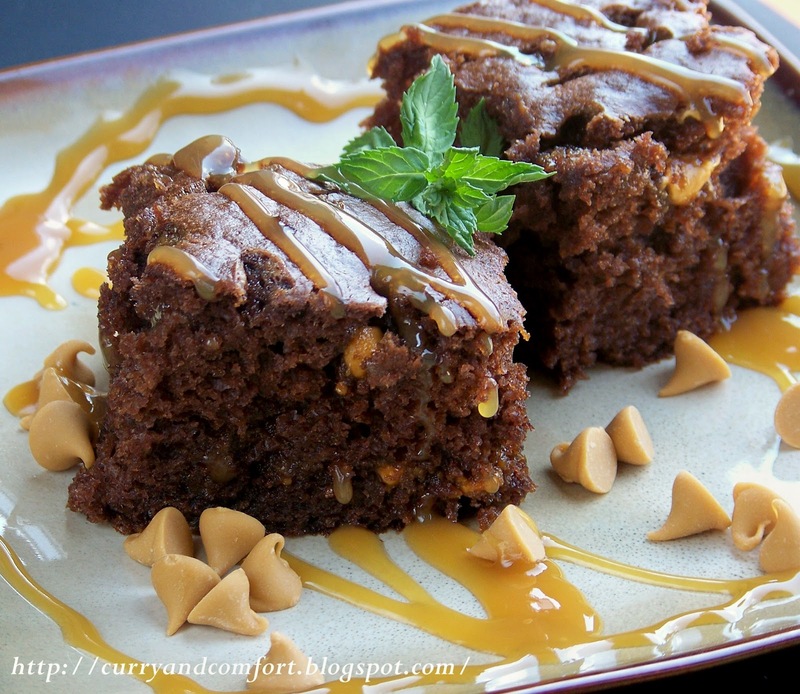 Finally toss in 1 cup (or half a bag) of the butterscotch chips and mix into the cake batter. 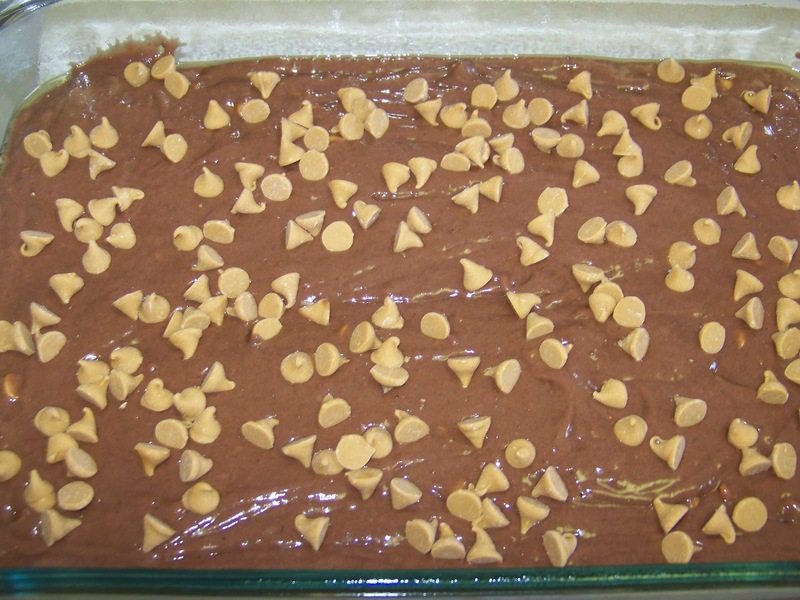 Then spray or grease a 9x13 baking pan and pour batter into one even layer. 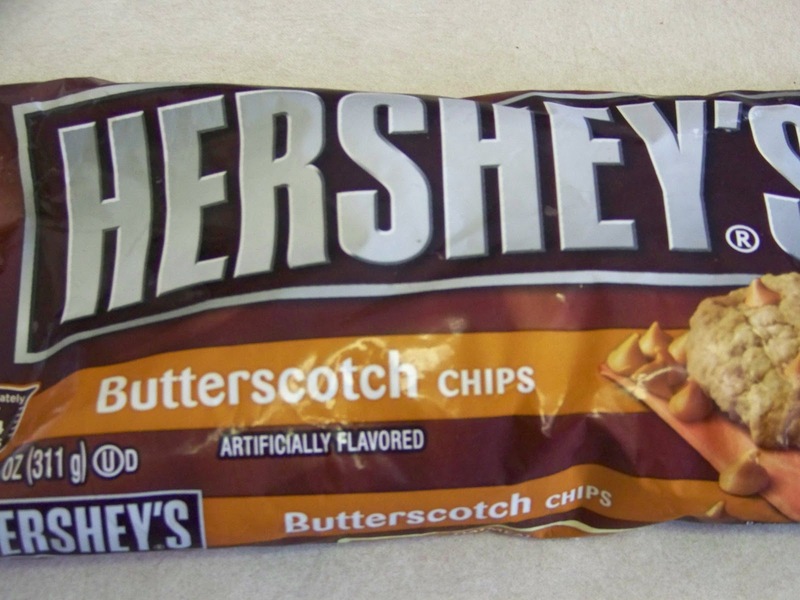 Take a large handful of butterscotch chips and place on top of batter. Place into a 350 degree oven and bake for 35-40 minutes or until cake is set in the middle. 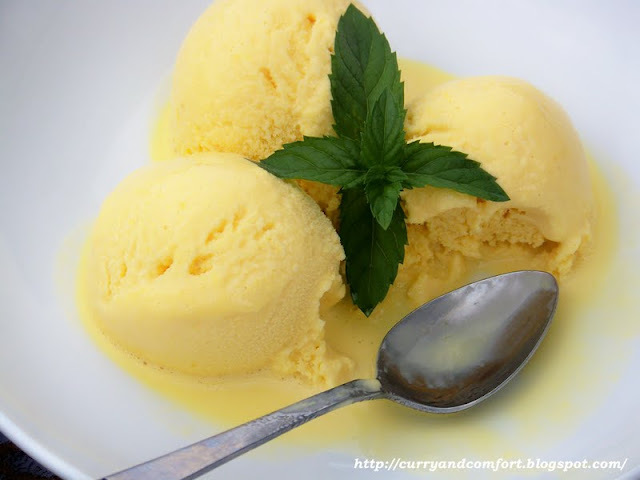 Serve hot or at room temperature with vanilla ice cream if you desire. 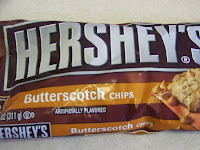 I also melted some butterscotch chips (the remainder from my bag) and made a sauce to pour over some of the pieces. Enjoy. I hope you are enjoying your Sunday! 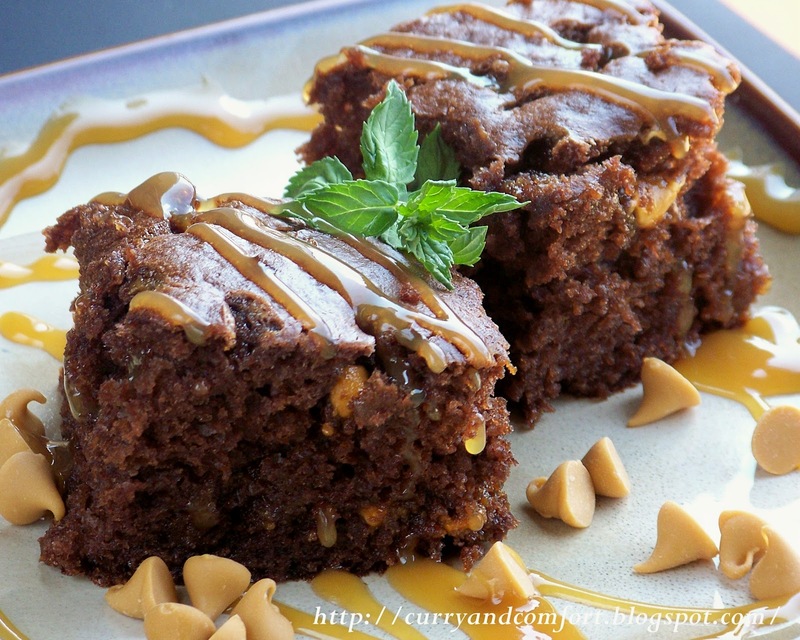 I thought I would start a new weekly feature where I round up my recipes of the week and maybe give some news or tidbits from what I have seen around the foodie community. 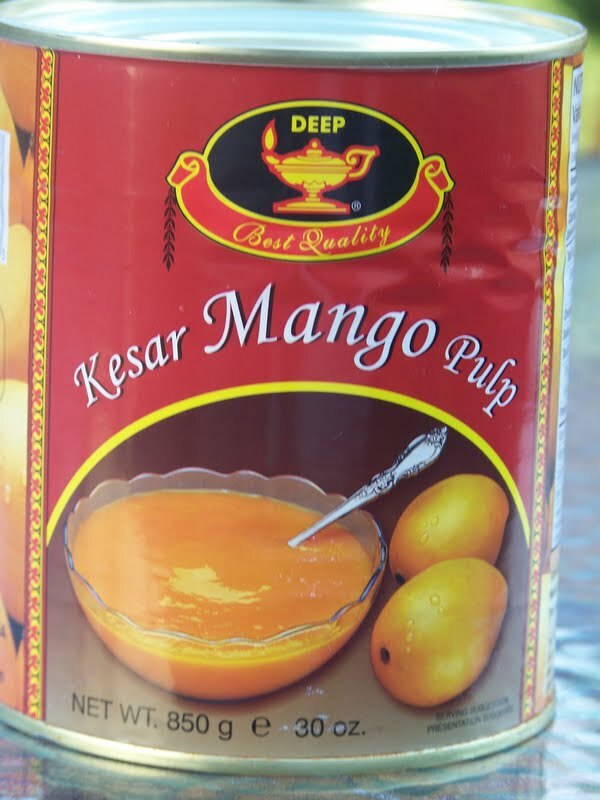 A while back I made a peanut dipping sauce that I could not stop eating. Looking for a quick dinner the other night I thought shrimp and noodles would be a great idea and this peanut sauce came to mind. 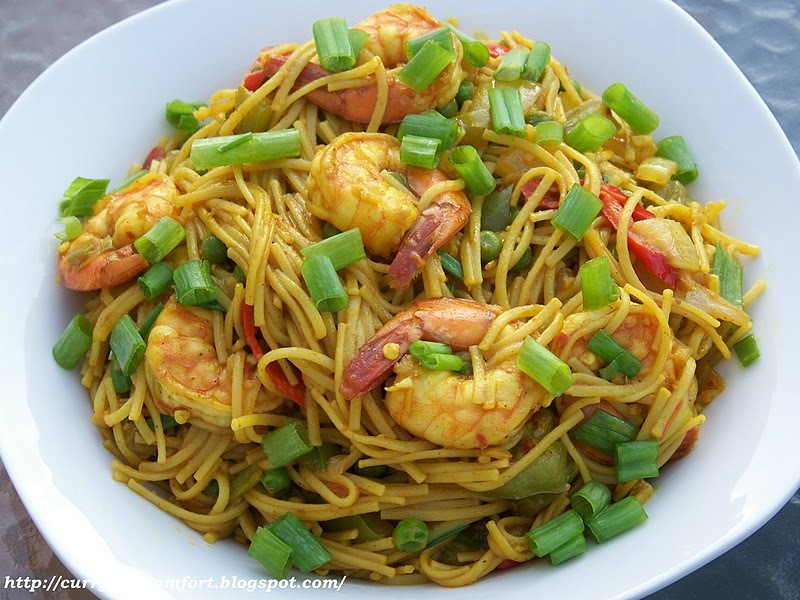 It's a pretty quick meal once you get the sauce ingredients ready and I really enjoyed it. I was even surprised my son and daughter enjoyed it so much. 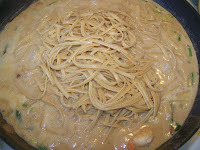 My husband is on the fence about savory peanut sauces... but he ate a plate of the noodles as well. Now this isn't a dish if you don't like savory peanut sauces...but if you are... you will definitely want to dive into this creamy bowl. 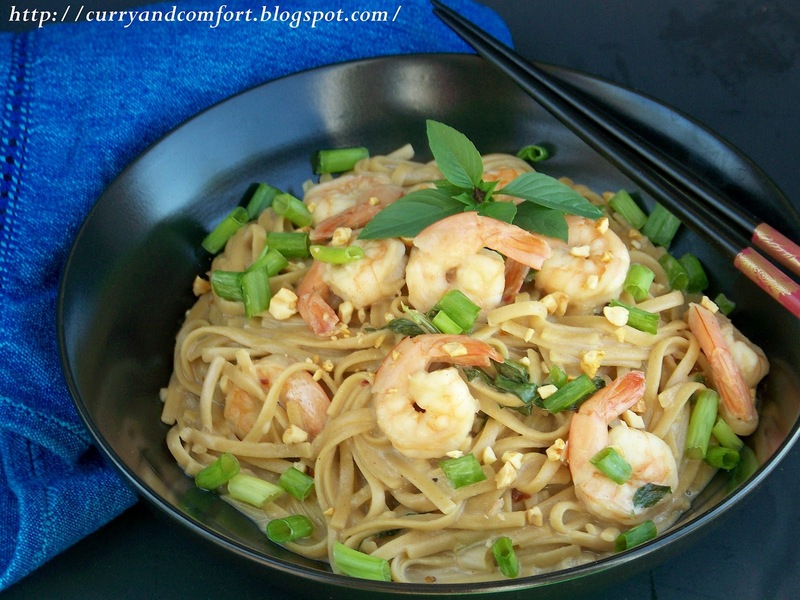 Directions: 1st cook noodles 2 minutes shy of your desired tenderness in well salted water. Drain and set aside. Heat a wok with 1 Tbs of canola oil. Add ginger/garlic and red chili flakes and fry for a few seconds without burning. Next add cleaned shrimp and the whites of the green onions. Saute for a few minutes. 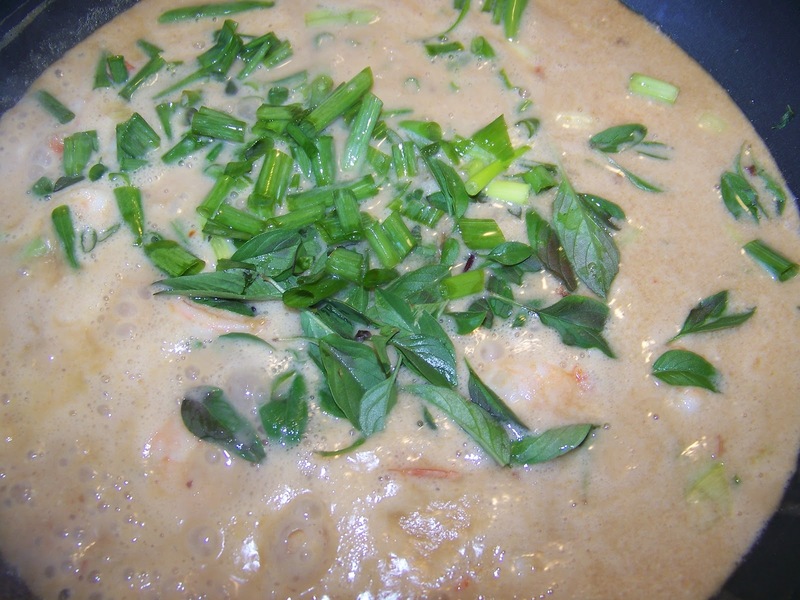 Add all the ingredients for the peanut sauce and bring to a simmer. 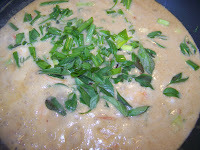 Then add half of the green onion tops and the Thai basil leaves. Taste for seasoning. 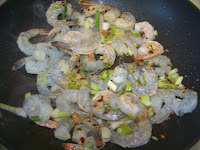 Add more fish sauce or soy sauce for salt flavor. 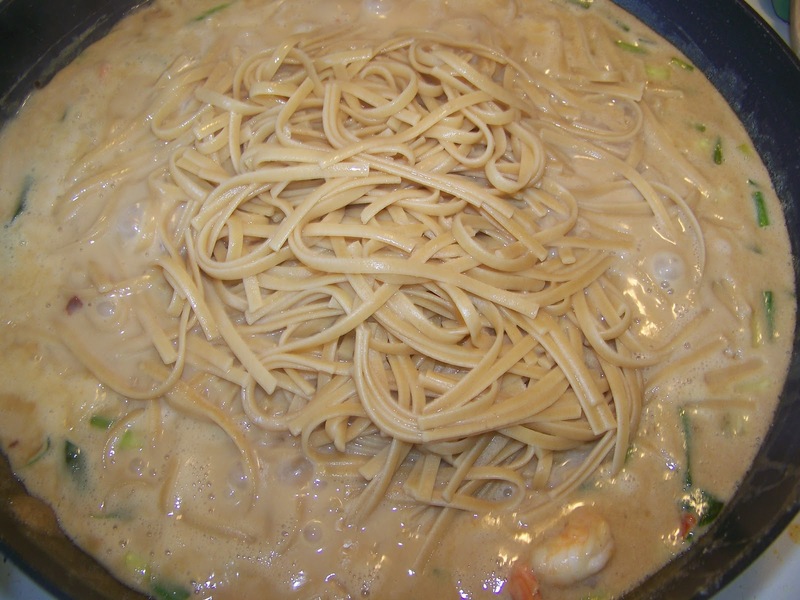 Add the drained pasta and cook with the sauce for 2-3 more minutes to finish cooking off the pasta. Taste again for seasoning. 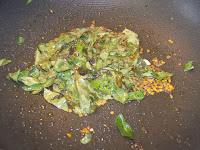 Garnish with more of the green onion tops and crushed peanuts. Eat hot or warm. Enjoy. My son recently celebrated his birthday and his grandmother (my mother) came over just to make his favorite rice dish. My son loves this rice so I had to ask my mother to show me how to make it. It's really simple with a a few key ingredients. You can cook it on the stove top or put it into a rice cooker to do the work for you... either way it's delicious! If you're wondering about the crispy onion "rings" surrounding the dish... that recipe will follow someday soon. 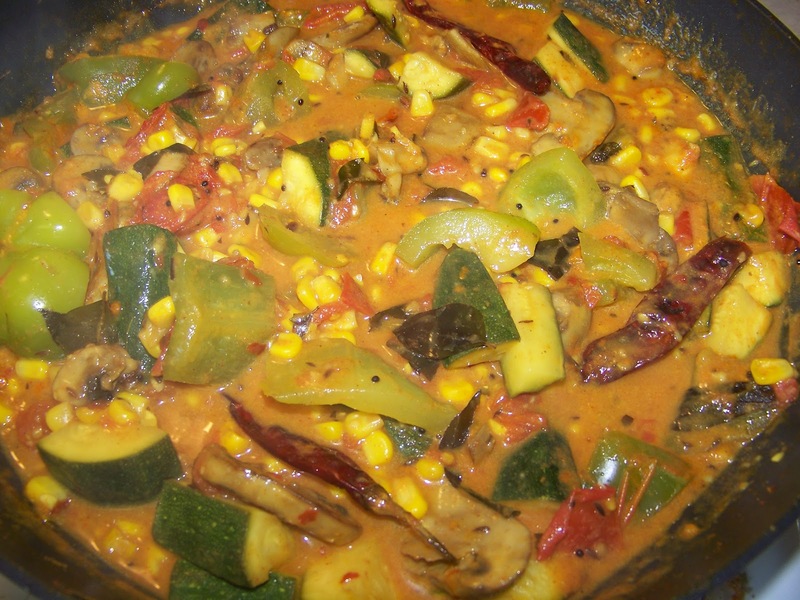 In a large pan, add the stick of margarine, onion, cinnamon stick, curry leaves, cardamoms and cloves. Fry on medium heat for several minutes until the onions begin to soften. Then wash the rice well and drain it. 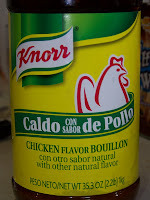 Add it to the frying pan and saute it with all the other ingredients for a few minutes. 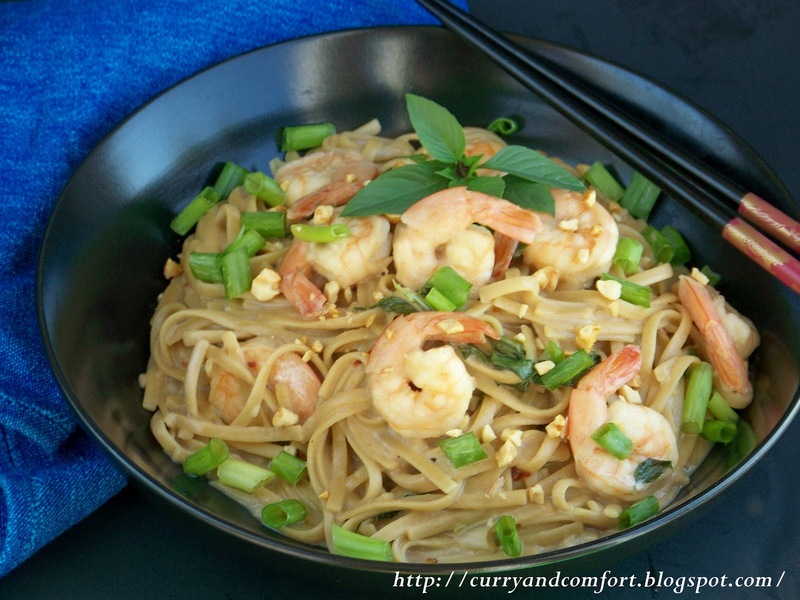 Transfer this to a large rice cooker or pot to cook the rice. 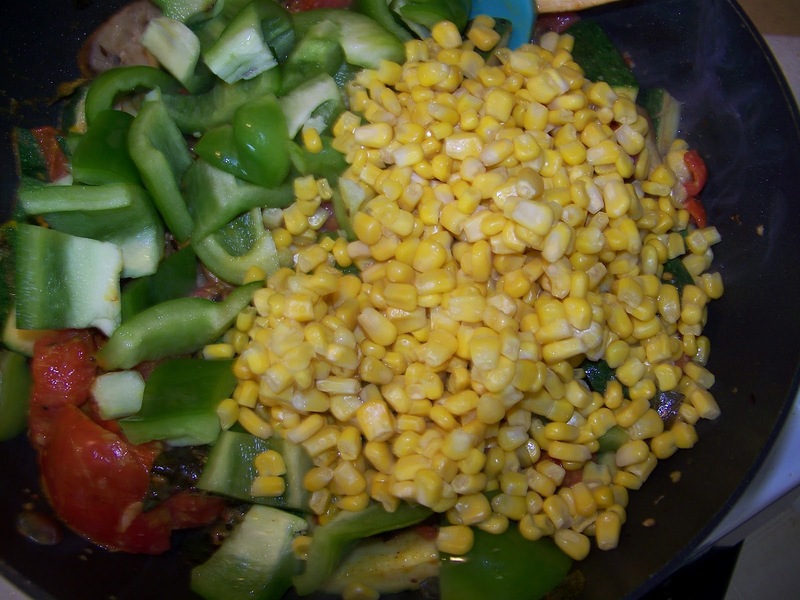 Heat the water (to cook the rice) on the stove (in a saucepan or kettle) so it is hot, but not boiling. 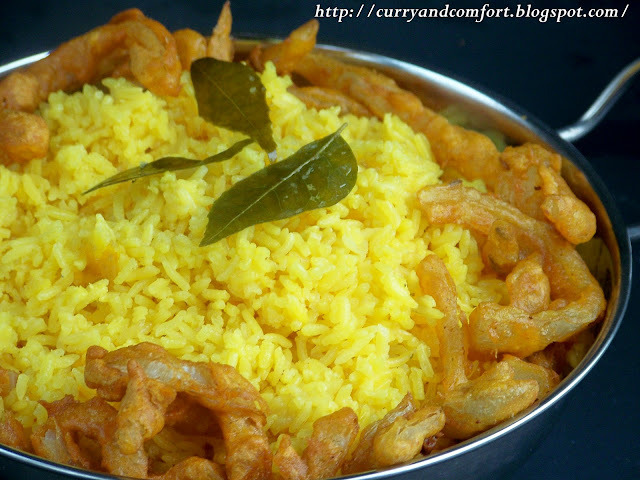 Then add the turmeric or steep saffron, chicken bullion powder to the rice and pour the hot water over rice to cook it. Taste for salt in the water. If more salt is needed, add some salt. Cook rice on stove top according to rice directions on package or in a rice pot until it is to your desired tenderness. 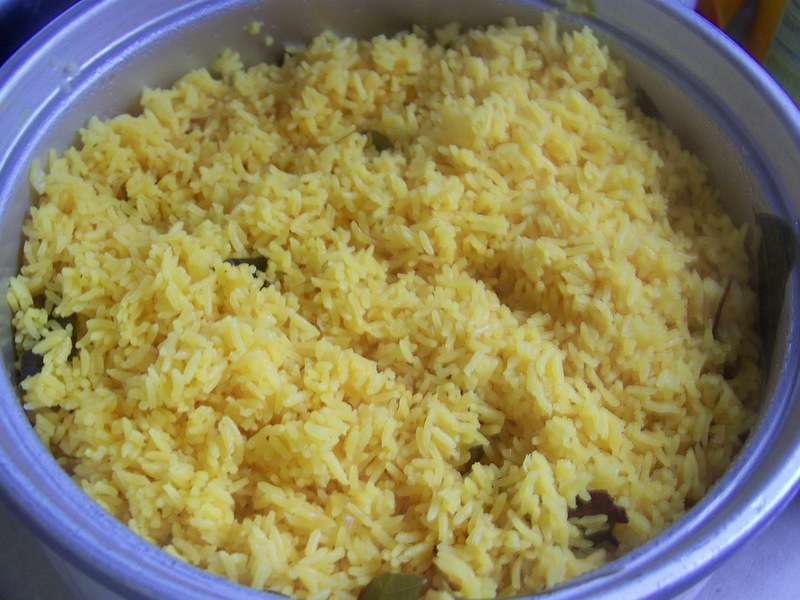 If the water cooks out and you want your rice cooked more, add 1/2 a cup of hot water at a time to the rice until you get the desired tenderness. Fluff rice and serve. Enjoy. Note: Do not eat the cardamoms, cloves and cinnamon stick, they are very strong tasting and used just to flavor the dish. The curry leaves are fine to eat. July is ice cream month and I have yet to get my ice cream maker off the shelf. 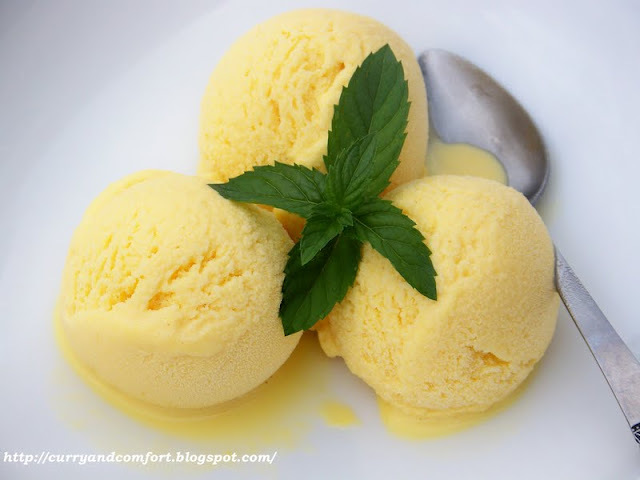 I decided to remind myself some of my homemade ice cream and this Mango Ice Cream is one of my family's favorites. I think I will dust off the ice cream maker and make some today! Blend all ingredients together. Pour into a freezable container and stick in the freezer. 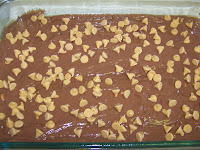 I took it out 2-3 times during the freezing process and stirred it to try to make it less crystallized and more creamy. Freeze until solid. Take it out 10 minutes before serving to allow it to thaw a little for easy scooping. The great thing about summer is all the fresh produce that is so bountiful. 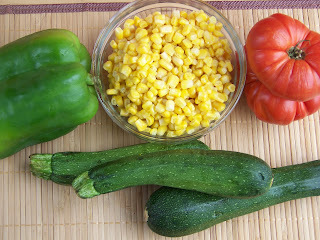 Tomatoes, Corn, Peppers and Zucchini are in full swing and I couldn't wait to use them all in one dish. 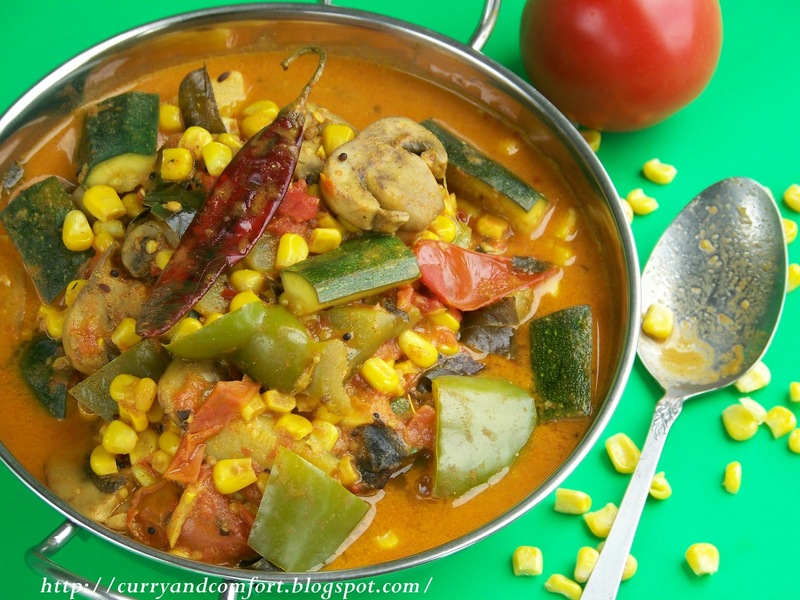 I put this curry together and simply loved the fresh flavors of the vegetables enhanced by the flavors of curry. We ate it over rice with a lentil dish and it was a delicious meal. 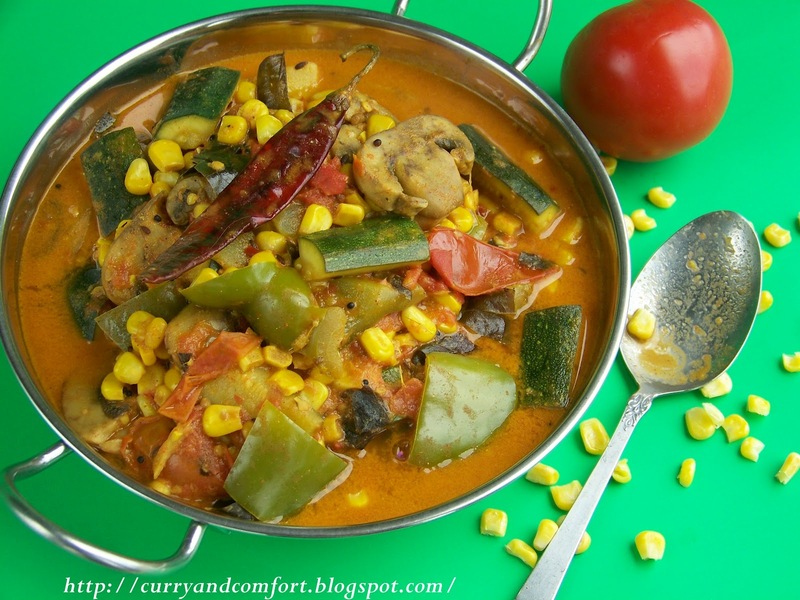 I know some of you have tomatoes and zucchini in your gardens so if you need a fun and spicy way to use them up, try this curry. 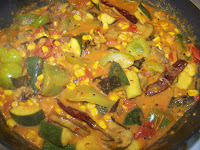 salt (to taste) You will need to salt the dish throughout because much of it will be absorbed by the vegetables. 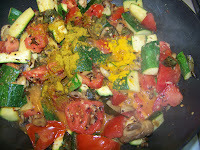 Heat 1 Tbs of canola oil in a large pan and add cumin seeds, mustard seeds, fenugreek seeds, cinnamon stick and curry leaves. Heat for 20-30 seconds without burning. 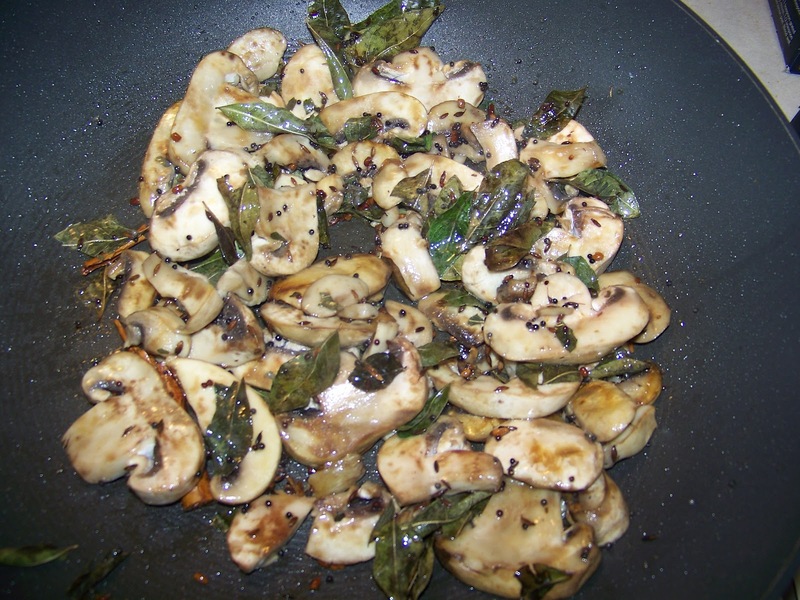 Next add garlic, ginger and the button mushrooms. 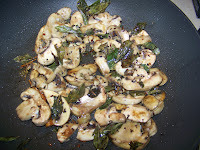 Saute a few minutes and allow the mushrooms to brown. Next add the zucchini to the pan. 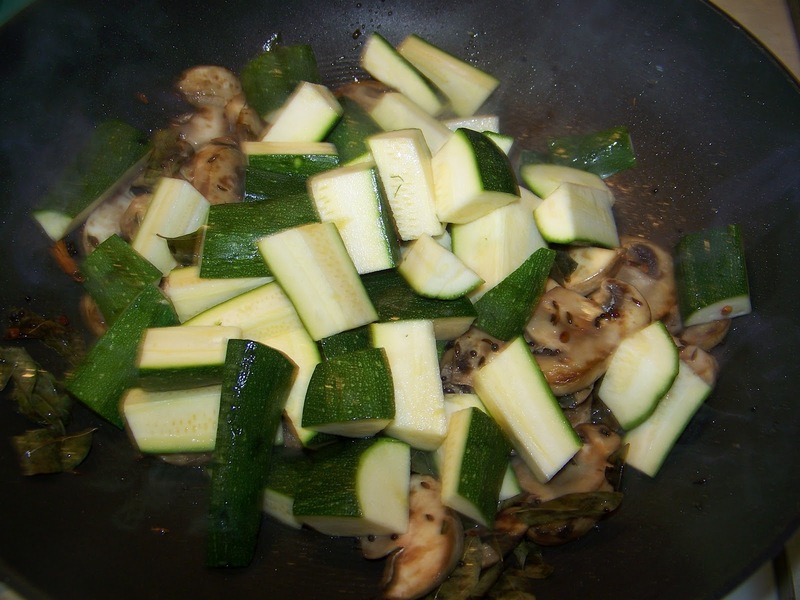 Saute a few minutes. 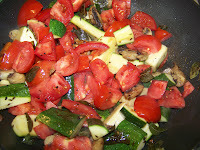 Then add the tomatoes to the pan and saute a few minutes. 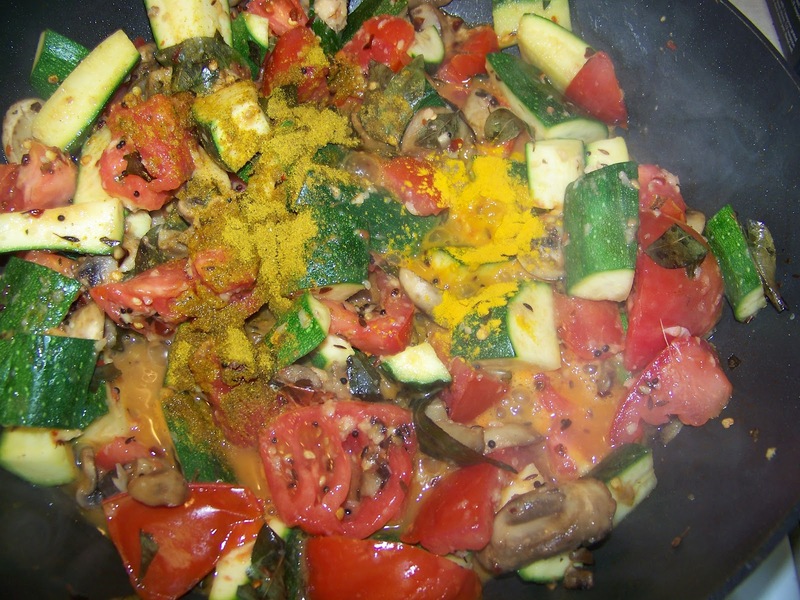 Then add the turmeric powder, curry powder, red chili flakes, salt, and cumin powder. Saute a few minutes. 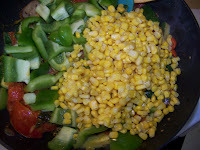 Then add the chopped bell pepper and the corn. If you want more gravy add water. 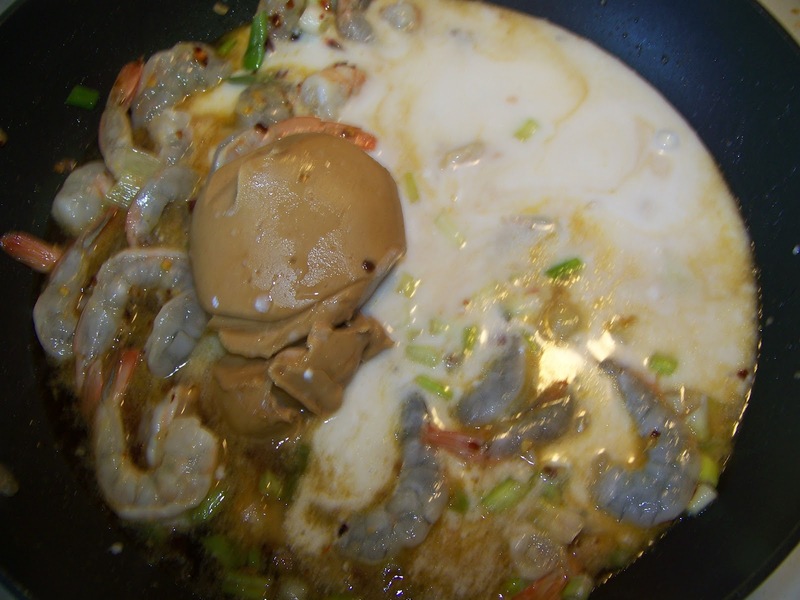 Cook for 12-15 minutes stirring occasionally. Finally add the coconut milk and simmer for another 2-3 minutes. Taste for salt and seasoning. Serve with rice. Enjoy. Mix all ingredients. Spray two 8 inch cake round pans and bake in a 350 oven according to package instructions (about 28-33 minutes). Once cakes have cooled take serrated knife and slice through the middle of each layer to make 4 thinner layers. Make pudding per package instructions with milk. Allow to firm for a few minutes and then fold in COOL WHIP topping. In a trifle bowl or a large deep bowl (glass preferable) dollop a little cream mixture on the bottom. 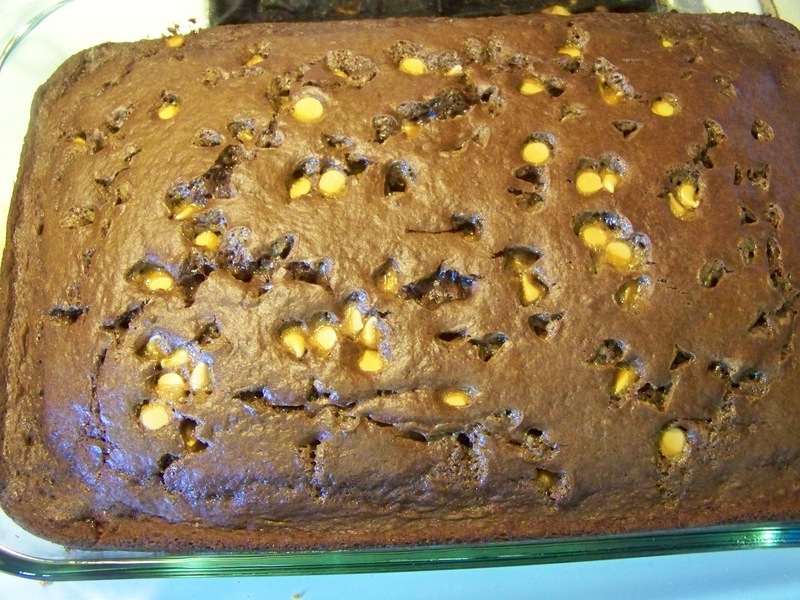 Take one layer of chocolate cake and place in dish. Take 1/3 of remaining cream and top chocolate cake. Repeat with cake layer and cream. Then add cherries layer, cake layer and cream layer. Top with the final layer of chocolate cake. I place it like this (covered with plastic wrap) into the fridge for 8-12 hours or over night. 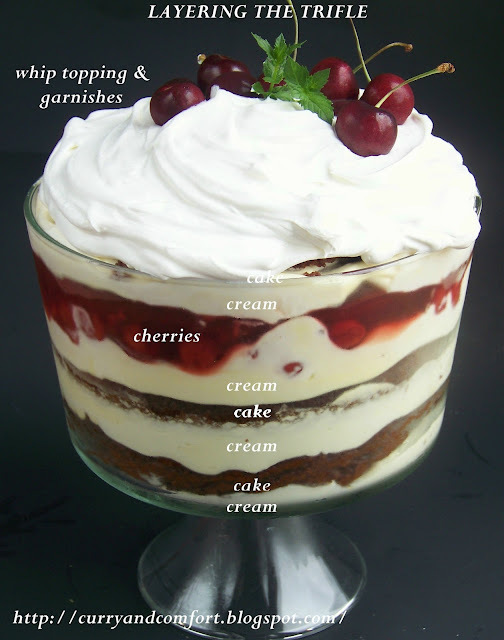 Then just before serving add the 2nd tub COOL WHIP Topping on top of the trifle. Garnishes with suggested ingredients from above. Enjoy.